Congratulations to our 2017 Central Mass Family Business Award winners and finalists, and special thanks to our presenting sponsor Bank of America/Merrill Lynch and supporting sponsor ROCG Consultanting, and to all who joined us for a night of celebration and networking! PROVO FINANCIAL SERVICES - 2017 Small Business Award! INSURANCE MARKETING AGENCIES - 2017 Midsize Business Award! ATLAS DISTRIBUTING, INC - 2017 Large Business Award! COMMIT FITNESS - 2017 New Business Award! POLAR BEVERAGES - 2017 Innovation Award! PUTTS & MORE FAMILY FUN CENTER - 2017 Family Values Award! Family-owned businesses are an integral part of the social and business fabric of Central Massachusetts. They contribute uniquely to our local economy and deserve special recognition. 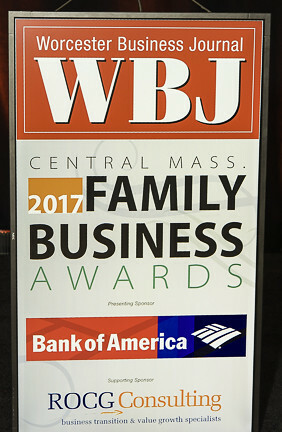 These awards recognize outstanding achievements in family-owned businesses and tell the story of a select group of the regions most successful firms.